Here, I summed it up for ya. You didn’t have to write a whole book! 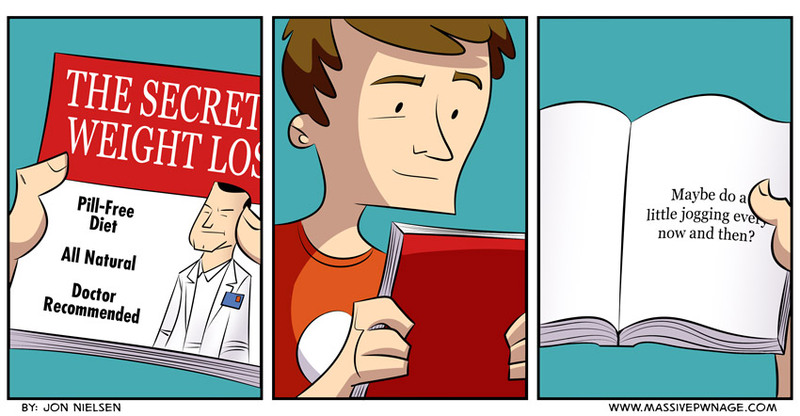 I apologize in advance for the weight loss ads that will smother the site now because of this comic. This entry was posted on Wednesday, April 23rd, 2014 at 12:00 am and is filed under Comics. You can follow any responses to this entry through the RSS 2.0 feed. Both comments and pings are currently closed. I have a job that involves a lot of walking around and bending down and carrying stuff. I don’t seem to be any more fit than I was before when I sat a desk all day! I think I must be at some sort of middle ground. I’m not losing or gaining weight. Maybe it’s all the cookies.